Have you ever been disgusted from the paper mess in the cockpit, in your car or in any other spot? The PilotsReference Binder™ is a good solution to minimize paper chaos. Have all important papers, cards, certificates, CDs and forms right at your fingertip while you can use the binder as clipboard - opened or closed. 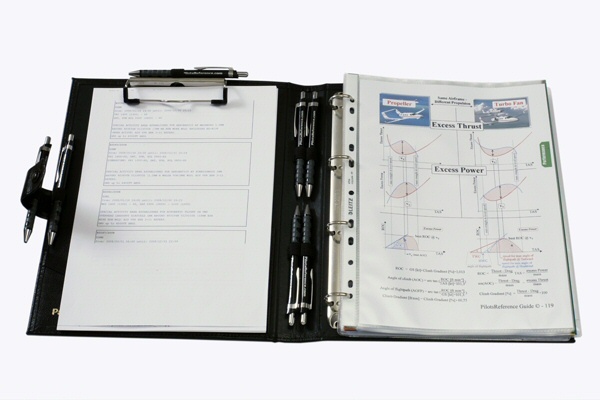 Unlike most kneeboards on the market the PilotsReference Binder™ is full size. All standard papers (EURO A4 & US letter) will fit in any place without folding. The heavy duty four ring binder mechanic is compatible to all standard sheet protectors and folder gimmicks available at all office depots in Europe and the United States.